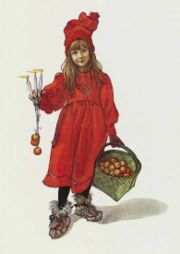 Because my parents were Scandinavian (Danish Mom, Norwegian Dad), we always celebrated Christmas on Christmas Eve. The day before, Mom cooked and mashed potatoes for the lefse, and made her Aeblekage (Apple Cake). Then the morning of Christmas Eve, Mom and Dad made lefse together; I was the official taster. This was always a joyous occasion, full of the spirit of Christmas. Then we all went up to open the bar. Mom made a fresh batch of Tom and Jerry (I was the official bowl-and-beater licker), and Dad gave a free T&J drink to each customer. It was always a busy day, as many people came to wish us a Merry Christmas, and also many just wanted to avoid the holiday altogether, by getting drunk. After the T&J was ready, Mom and I went home to get dinner ready. There was red cabbage slaw, boiled potatoes, creamed peas, cranberry sauce (from a can because fresh cranberries were not available here back then), lutefisk (cooked right before serving), and lefse with lots of butter. Once the dinner dishes were cleared away, we gathered in the living room to open presents and sing Christmas songs. I was Santa’s helper and handed out the gifts. That was followed by Mom’s Aeblekage with fresh whipped cream for dessert. Then on Christmas Day, I went to the Tanghe’s, who lived next door, to share in their Christmas celebrations. Rena often made turkey, but sometimes she did a leg of lamb or a standing rib roast. And her fudge! In the early 1970s, when I was on my own in Portland, I tried to recapture that same holiday experience. I invited several women friends to help me cook the lefse in the morning. Then in the evening I served my dinner to those same friends and their boyfriends/partners. Most of my guests ate the lutefisk, but for those who did not want to try it, I made poached or baked wild salmon, with mustard sauce. Then I went to Christmas Eve service at Trinity Episcopal in my Portland neighborhood with any friends who wished to tag along. Over the years, my celebration grew to include roast prime rib for Christmas Day. Here in Montana, I don’t have a dining room to seat many friends, but I still celebrate the holidays with the same menu, sharing with just one or two close friends. And on Christmas Eve, after dinner, I go to the late Christmas Eve candlelight service at Bethany Lutheran Church. Like my Mom before me, I start the preparations on December 23. Then both Christmas Eve and Day are filled with cooking chores as well. I’m totally exhausted by December 26. Because it is getting harder for me to remember all the tasks and when to do them, and because I want to share my tradition with my readers, I have documented this information here. NOTE: each menu item will be linked to the appropriate recipe as they are added to this new blog. If using homemade Rusk, bake it on December 22 or earlier. If making your own pickled beets, start Dec 15 or earlier, to give time to mellow. If making your own veal or beef stock (for the Red Currant & Cranberry Sauce to go with the Prime Rib), make it on Dec 22 or earlier. This entry was posted in Beef, Buffalo, Bread, Fish, Legumes, Root Veggie, Vine veggies and tagged lefse, lutefisk, prime rib, salmon, xmas. Bookmark the permalink.